Why So Many Black Seashells? Seashells come in many lovely colors, but it’s odd to find all black seashells. Certain shells have dark lines or spots and are made that way by the snail inside, but this is different. One day while collecting shells, I found an unusual number of all-black shells. Sometimes out in the wild a living shell, or shell still under the water, will be covered in a dark, sometimes fuzzy, coating. That is the periostracum, or skin, which creates an outer layer over the shell. I have a horse conch which I cleaned, but never removed all that layer. The shell underneath was still light colored. But some shells, like these Jingle shells, are all black. They may have begun as some pretty orange or white color, but have turned black due to the sediment where they were buried. It has to do with sulfur content in the sand, or something. I am no scientist, so I won’t try to explain the process – I would just confuse myself and you! My message here is that they don’t begin black. These jingle shells were collected near Ponce Inlet on the East coast of Florida. You can see that one of them (in the photo above) is just beginning to turn from it’s light orange color. It may not have been buried as long as the others. Constant wave action is bound to unearth shells and eventually wash them ashore. Below, I have worn oyster shells and piece of something that was probably a whelk among the ridged jingle shells. The partial whelk shell below has also turned black. These shells do not start out this way. 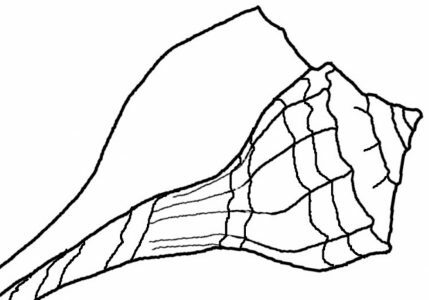 Whelks are generally tan with brown stripes or light in color. The one in my photo below is probably either a Lightning Whelk or Knobbed Whelk. It’s too broken for me to tell. Shells are often not pretty when found. Especially if they are found in the water. They can be dark or coated with green, with barnacles or oysters attached. Shells found up on the sand can be white, or much lighter in color that they were when inhabited. The sun can bleach them. This makes seashell identification harder. It can be just as difficult when collecting shells that have turned totally black. I found many black whelck conch shells on the coast of North Carolina. I was giving them away on a ferry and people told me they were very old. Is this true? Hi Karen, they probably are old but I don’t know how “old”. It takes a while for shells to turn black from being buried in certain types of sand for a long time. I don’t know how long it takes for them to turn black. I was at Murrell’s Inlet, SC last week and saw many black shells, scallops, oysters, whelks, cockles, etc. It seemed very odd to me. Since this was the week on the total eclipse, I started calling them “eclipse” shells. I was searching the web to see why they were black when I found your blog. I have collected shells from many of our American beaches, throughout FL, AL, GA, SC, TX, LA, CA over the last 50 plus years. I have never seen so many at one time. Maybe all those black shells were unearthed by a storm? I like your choice of naming them “eclipse shells”. You must have a nice collection from your travels. I would love to travel to, and do some shelling, on the South Carolina coast. Thanks for sharing!